Compared to other gears (i.e., longline, purse seine) few tuna are caught globally by troll/ pole-and-line. Troll/poles-and-line are the most commonly used gears to catch skipjack in the Indian Ocean, with about 120,000 t landed by troll/ poles-and-line in 2012. Skipjack tuna are the smallest of the tuna and have a medium inherent vulnerability to fishing. Based on the most recent stock assessments, all skipjack stocks are currently not overfished and no overfishing is occurring. The management body responsible for management of all tuna in the Indian Ocean is the Indian Ocean Tuna Committee (IOTC). While stock assessments are performed regularly, there are ongoing concerns of vessel non-compliance with regulations, and improper catch reporting by member fishing countries is also a common occurrence. Due to their high selectively, troll/pole and line gears cause minimal bycatch– less than 1% of the catch is non-target species. Occasionally overfished bigeye tuna can be caught as bycatch, and in these cases, bigeye are retained rather than discarded. The majority of non-target species can be released live due to the nature of the fishing method. Trolls/poles-and-line do not make contact with the ocean floor and therefore cause little to no habitat damage. In order to catch skipjack, smaller forage fish (e.g., sardines) are used as bait; the effect of the removal of these species on the ecosystem is unknown and few bait fisheries are managed. Purse seines are the most common gear used to catch skipjack tuna. Three main purse seine methods are used to catch this species: unassociated, dolphin-associated, and FAD sets. Only skipjack caught with unassociated or dolphin-associated purse seines is sustainable. Catches made by purse seines in the Indian Ocean currently amount to just under 100,000 t annually, with very few (less than 10%) of these landings from unassociated sets. Skipjack have life history characteristics that make them moderately vulnerable to fishing pressure. According to the most recent stock assessments, populations of skipjack tuna in all three oceans are not overfished and no overfishing is currently occurring. The management body responsible for management of all tuna in the Indian Ocean is the Indian Ocean Tuna Committee (IOTC). Regular stock assessments are performed, and spatial closures and catch limits have been set up for the purse seine fleet in recent years. As of 2014, any discarding of target tuna caught by purse seines was prohibited. Despite these imposed regulations, there are ongoing concerns of vessel non-compliance and improper catch reporting by member fishing countries. These purse seine methods catch non-target species, although at a much lower rate than those that use fish aggregating devices (FADs). Nonetheless, the unassociated purse seine fleet still catches some shark species of concern (i.e., whale sharks, silky sharks). Unassociated and dolphin-associated purse seines do not make contact with the ocean floor and therefore cause minimal habitat damage. However, in removing large quantities of high trophic level species such as tunas and sharks, these fisheries could potentially influence large changes to the structure and function of the ecosystem in the future. Compared to other gears (i.e., longline, purse seine) few tuna are caught globally by troll/ pole-and-line. Catches by these gears currently make up only 5% of the total tuna landed in the Pacific. However, troll/poles-and-line are the most commonly used gears to catch skipjack in the Indian Ocean, with about 120,000 t landed by troll/ poles-and-line in 2012. Total catches of skipjack in the Atlantic Ocean in 2013 were just over 220,000—only about 10,000 t was caught with trolls/poles-and-line. Greenstick gear was developed to reduce the high bycatch levels that are characteristic of longlines. Skipjack tuna are primarily caught by bait boats in the Western Atlantic. In 2013, 17,996 tonnes of skipjack tuna were caught in the Western Atlantic. Purse seines are the most common gear used to catch skipjack tuna. Three main purse seine methods are used to catch this species: unassociated, dolphin-associated, and FAD sets. Only skipjack caught with unassociated or dolphin-associated purse seines is sustainable. In the Atlantic Ocean, about 172,000 t of skipjack were caught with purse seines in 2013 (less than 50% with unassociated sets). Skipjack tuna are the smallest of the tuna and have life history characteristics that make them moderately vulnerable to overfishing. Based on the most recent stock assessments, all skipjack stocks are currently not overfished and no overfishing is occurring. Although there is some uncertainty surrounding the Atlantic stock assessment results, there are currently no concerns over the health of these stocks. The management body responsible for management of all tuna in the Atlantic Ocean is the International Commission for the Conservation of Atlantic Tunas (ICCAT). There are no management measures specific to skipjack tuna, however a time area closure of the fishery which protects juvenile bigeye tuna also protects skipjack tuna. Stock assessments are performed every 4-6 years. 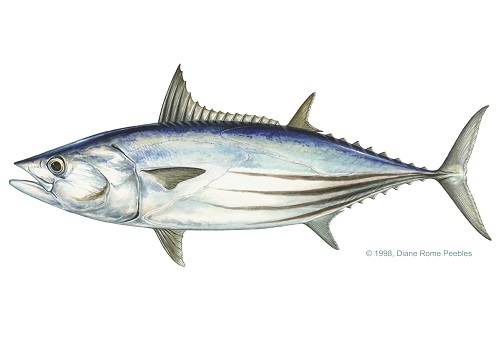 There are no catch limits for skipjack tuna; however the population appears to be healthy. As greenstick fishing occurs within federal waters of the US, the US National Marine Fisheries Service (NMFS) is the organization responsible for the greenstick skipjack tuna fishery. Management has been successful at reducing bycatch by introducing greenstick gear. Catches of non-target species of concern such as Atlantic Bluefin tuna, sea turtles, and sea birds has been reduced. There are no catch limits for skipjack caught in the greenstick fishery. Other regulations include fishing permits, maintenance of logbooks, and compliance with international regulations set by the International Commission for the Conservation of Atlantic Tunas (ICCAT). However, skipjack tuna is included in a multi-year conservation plan under ICCAT and stock assessments are performed every 4-6 years. Due to their high selectively, troll/pole and line gears cause minimal bycatch– less than 1% of the catch is non-target species. Occasionally overfished bigeye tuna can be caught as bycatch, and in these cases, bigeye are retained rather than discarded. The majority of non-target species can be released live due to the nature of the fishing method. Skipjack tuna is caught incidentally in greenstick gear which catches primarily yellowfin tuna. The latter makes up about 83% of the catch. Due to its high selectivity, greenstick gear cause minimal bycatch. Other incidental catches include other tuna species, mahi mahi and other bony fish. These purse seine methods catch non-target species, although at a much lower rate than those that use fish aggregating devices (FADs). Nonetheless, the unassociated purse seine fleet still catches some shark species of concern (i.e., whale sharks, silky sharks). Since dolphin-associated purse seiners in the East Pacific target skipjack tuna as they school with pods of dolphins, high dolphin mortality was common with this fishing practice in the past (1960s and 1970s). However, substantial effort has gone into mitigating dolphin bycatch such that it is no longer a significant problem. Unassociated and dolphin-associated purse seines, and trolls/poles-and-line do not make contact with the ocean floor and therefore cause minimal to no habitat damage. In order to catch skipjack, smaller forage fish (e.g., sardines) are used as bait; the effect of the removal of these species on the ecosystem is unknown and few bait fisheries are managed. Greensticks do not make contact with the ocean floor and therefore cause little to no habitat damage. However, in removing large quantities of high trophic level species such as tunas and sharks, these fisheries could potentially influence large changes to the structure and function of the ecosystem in the future. Skipjack tuna are primarily caught by purse seine and make up the majority of tuna catches in the Pacific Ocean (currently about 1.6 million t are landed annually). By this standard, landings from the Hawaiian longline fishery are virtually negligible. Longline landings in Hawaii peaked at 204 t in 2000 and, in 2010, 150 t of skipjack tuna were landed here. Skipjack tuna have life history characteristics that make them moderately vulnerable to overfishing. Based on the current stock assessment for skipjack in the western and central Pacific Ocean, the population of skipjack tuna targeted by the Hawaiian longline fishery is not overfished and no overfishing is currently occurring. The longline fisheries in Hawaii are fishery are managed by the state of Hawaii and the US Western Pacific Regional Fishery Management Council (WPRFMC). Given that they target highly migratory species (i.e., swordfish and tuna), these fisheries are also under the jurisdiction of the Western and Central Pacific Fisheries Commission (WCPFC) in the west Pacific and Inter-American Tropical Tuna Commission (IATTC) in the east. 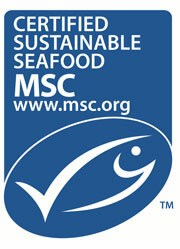 Domestic measures are moderately effective, and place emphasis on preventing overfished stock status. Observer coverage is 100% in the shallow-set fishery and 20% in the deep-set and bycatch monitoring and mitigation efforts are highly effective. Typically, deep-set longlines catch fewer seabirds and sea turtles than shallow-set lines. However, deep-set lines are known to catch more large marine species, including whales and sharks. Specifically, the Hawaiian deep-set longline fishery has some bycatch of false killer whales and shortfin mako sharks. Shallow-set and deep-set longlines rarely contact the seafloor. As such, they have minimal impact on the surrounding marine environment. The species caught in the Hawaii longline fisheries are managed under a Fishery Ecosystem Plan that aims to address fishery effects on other species, habitats and the ecosystem as a whole. However, the continued removal of large predatory fish from the ecosystem is not yet fully understood. Compared to other gears (i.e., longline, purse seine) few tuna are caught globally by troll/ pole-and-line. Catches by these gears currently make up only 5% of the total tuna landed in the Pacific. Skipjack tuna are the smallest of the tuna and have a medium inherent vulnerability to fishing. Based on the most recent stock assessments, all skipjack stocks are currently not overfished and no overfishing is occurring. The management body responsible for management of all tuna in the western Pacific Ocean is the Western and Central Pacific Fisheries Commission (WCPFC) and in the eastern Pacific it is the Inter-American Tropical Tuna Commission (IATTC). Stock assessments for all tuna species are performed on a regular basis, and all information suggests that the troll/ pole-and-line fisheries for skipjack are properly managed. Due to their high selectively, troll/pole and line gears cause minimal bycatch– less than 1% of the catch is non-target species. Occasionally overfished bigeye tuna can be caught as bycatch, and in these cases, bigeye are retained rather than discarded. The majority of non-target species can be released live due to the nature of the fishing method. Trolls/poles-and-line do not make contact with the ocean floor and therefore cause little to no habitat damage. In order to catch skipjack, smaller forage fish (e.g., sardines) are used as bait; the effect of the removal of these species on the ecosystem is unknown and few bait fisheries are managed. Skipjack tuna populations are healthy, with stock assessments indicating that abundance has been increasing for the past 20 years. There is no indication that fishing mortality, though increasing, is negatively impacting the stock. Bycatch is generally very low. Management is through the Inter-American Tropical Tuna Commission (IATTC) in the high seas waters of the eastern Pacific Ocean, though the majority of management measures apply specifically to the purse seine and longline fisheries, not the troll, pole and line and handline fisheries. Gear does not impact the bottom habitat, and although the IATTC takes into account ecosystem factors in management decisions, these do not directly impact the troll, pole and handline fisheries. Purse seines are the most common gear used to catch skipjack tuna around the world. Three main purse seine methods are used to catch this species: unassociated, dolphin-associated, and FAD sets. Only skipjack caught with unassociated or dolphin-associated purse seines are sustainable. Purse seine catches of skipjack tuna in the east Pacific amounted to almost 280,000 t in 2013 (70% caught with FADs), and 1.8 million t in 2013 in the west (50% FADs). In the Indian Ocean, about 80,000 t of skipjack are landed annually at present. Purse seine catches in Atlantic were just under 175,000 t in 2013. Skipjack have life history characteristics that make them moderately vulnerable to fishing pressure. According to the most recent stock assessments, populations of skipjack tuna in all oceans are healthy (not overfished) and no overfishing of skipjack is occurring. The management body responsible for management of all tuna in the Atlantic Ocean is the International Commission for the Conservation of Atlantic Tunas (ICCAT). There are no management measures specific to skipjack tuna, however a time area closure of the fishery which protects juvenile bigeye tuna also protects skipjack tuna. Restrictions on FAD fishing also impact skipjack tuna. Stock assessments are performed every 4-6 years. There are no catch limits for skipjack tuna; however the population appears to be healthy. Management is lacking in bycatch strategies. Although regulations are in place to reduce bycatch, they are insufficient given the high impact of FAD purse seines. Fish-aggregating devices (FADs) are large objects left in the ocean to attract a target tuna species (e.g., skipjack tuna). However, they also attract numerous other marine species (including other tunas, sharks, sea turtles, and birds). Many of the tuna they catch in association with their target catch are juveniles of other species (e.g., bigeye), and some of the non-target species caught are also of threatened or endangered status. Of special concern are the oceanic whitetip shark and the silky shark. Some purse seines using FADs are anchored to the seafloor, but most do not contact the bottom and therefore cause minimal habitat damage. Nonetheless, since there are no limits on the number of FADs placed in a given fishing area, there is potential for the ecosystem impacts (particularly with regard to removing juvenile fish and non-target sharks and other marine species) of FAD use to be substantial. Purse seines are the most common gear used to catch skipjack tuna around the world. Three main purse seine methods are used to catch this species: unassociated, dolphin-associated, and FAD sets. Only skipjack caught with unassociated or dolphin-associated purse seines are sustainable. Purse seine catches of skipjack tuna in the east Pacific amounted to almost 280,000 t in 2013 (70% caught with FADs), and 1.8 million t in 2013 in the west (50% FADs). In the Indian Ocean, about 80,000 t of skipjack are landed annually at present. Purse seine catches in Atlantic were just under 175,000 t in 2013. Skipjack have life history characteristics that make them moderately vulnerable to fishing pressure. According to the most recent stock assessments, populations of skipjack tuna in all oceans are healthy (not overfished) and no overfishing of skipjack is occurring. The management body responsible for management of all tuna in the Indian Ocean is the Indian Ocean Tuna Committee (IOTC). Regular stock assessments are performed, and catch limits and spatial closures have been set up in recent years. The IOTC also has management measures in place specific to purse seine fisheries. Countries had to submit a FAD management plan to the Commission by the end of 2013. However, the information required for these plans does not need to be submitted until 2015. In addition, there are ongoing concerns of vessel non-compliance with regulations, and improper catch reporting by member fishing countries is also a common occurrence. Fish-aggregating devices (FADs) are large objects left in the ocean to attract a target tuna species (e.g., skipjack tuna). However, they also attract numerous other marine species (including other tunas, sharks, sea turtles, and birds). Many of the tuna they catch in association with their target catch are juveniles of other species (e.g., bigeye), and some of the non-target species caught are also of threatened or endangered status. Of special concern are the oceanic whitetip shark and the silky shark. Some purse seines using FADs are anchored to the seafloor, but most do not contact the bottom and therefore cause minimal habitat damage. Nonetheless, since there are no limits on the number of FADs placed in a given fishing area, there is potential for the ecosystem impacts (particularly with regard to removing juvenile fish and non-target sharks and other marine species) of FAD use to be substantial. Purse seines are the most common gear used to catch skipjack tuna around the world. Three main purse seine methods are used to catch this species: unassociated, dolphin-associated, and FAD sets. Only skipjack caught with unassociated or dolphin-associated purse seines are sustainable. Purse seine catches of skipjack tuna in the east Pacific amounted to almost 280,000 t in 2013 (70% caught with FADs), and 1.8 million t in 2013 in the west (50% FADs). In the Indian Ocean, about 80,000 t of skipjack are landed annually at present. Purse seine catches in Atlantic were just under 175,000 t in 2013. Skipjack have life history characteristics that make them moderately vulnerable to fishing pressure. According to the most recent stock assessments, populations of skipjack tuna in all oceans are healthy (not overfished) and no overfishing of skipjack is occurring. The management body responsible for management of all tuna in the western Pacific Ocean is the Western and Central Pacific Fisheries Commission (WCPFC), and in the eastern Pacific it is the Inter-American Tropical Tuna Commission (IATTC). Although many stock management measures exist, there are no limits on the number of FAD sets used per year and management has thus far been ineffective in reducing bycatch on FAD sets. Fish-aggregating devices (FADs) are large objects left in the ocean to attract a target tuna species (e.g., skipjack tuna). However, they also attract numerous other marine species (including other tunas, sharks, sea turtles, and birds). Many of the tuna they catch in association with their target catch are juveniles of other species (e.g., bigeye), and some of the non-target species caught are also of threatened or endangered status. Of special concern are the oceanic whitetip shark and the silky shark. Some purse seines using FADs are anchored to the seafloor, but most do not contact the bottom and therefore cause minimal habitat damage. Nonetheless, since there are no limits on the number of FADs placed in a given fishing area, there is potential for the ecosystem impacts (particularly with regard to removing juvenile fish and non-target sharks and other marine species) of FAD use to be substantial.